4-Story Loft Colorful Glam Bathroom Remodel: One Room Challenge - Week 1. We’re so excited to be participating in the One Room Challenge (ORC) this spring, our first time! We figured this bathroom project would be perfect for the ORC as our client has a super fun aesthetic and is letting us doing something we’ve never seen done before in a bathroom! She loves color and glam. For those of you already familiar with us, you know that her style is basically the opposite of our personal style. So it has been really fun to apply our signature bold and layered through texture design approach to her love for color and glam. We’re actually remodeling quite a few spaces for this client - 2 bathrooms, 1 “treehouse” and 3 staircases. So make sure you follow us on Instagram and check out our other blog posts so you can see the progress in her other spaces. Now onto this bathroom! 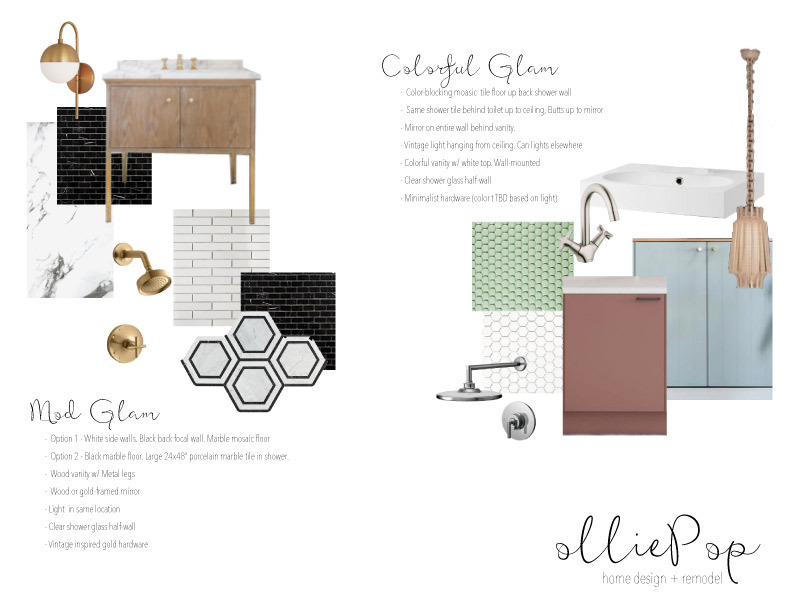 We’re calling it Colorful Glam because in this bathroom we’re using lots of bold pops of color, whereas in her second bathroom we’re going to stick to white, black and gold. Since this is week 1 of the ORC, let’s do a little intro first, shall we? I’m Kassina, I own olliePop Design and am the principle designer. We’re a full-service Interior Design + Remodel company based in St Paul, MN, serving clients both locally and nationally. We’re known for our bold, layered and textured style. We NEVER do the same thing twice as it’s our passion to help define our client’s true aesthetic and bring THEM out in their space, not US. So while no 2 projects are alike, you can see our signature style come through in each project. I started my company out of a need for a flexible schedule to take my daughter to 4-5 doctor appointments a week after my first-born almost died during childbirth. You can read more about that story over here. I grew up in a family of real estate builders/investors, who did projects for themselves with each of us pitching in and trading labor hours. I always loved design and went to school for both design and architecture but never intended to do work for anyone else. I just planned to follow in my family’s footsteps and do my own real estate endeavors. Except I wanted my projects to be completely unique and total showstoppers. So it was quite a tragedy-turned-blessing, because here we are now nationally recognized for our designs and working hard on lots of amazing client projects! Who knew, right? Alright, back to the Colorful Glam bathroom. I’m sharing some pics of the entire loft so you can get an idea of how unique and historic it is. The pictures are from the listing, so ignore the fact that it’s not very cool (yet!). The front of the building shows 3 stories but it’s actually 4 as the back has another level. Not shown here is that her unit has an amazing top level “treehouse” that opens up to a rooftop deck overlooking downtown St Paul and the Mississippi River. Talk about real estate gold, amiright? These pictures show the exterior, main level (which is where this bathroom is), one of the fun staircases with an exposed brick wall, and the treehouse. Our client is fun. Period. We truly were given some freedom to think outside the box on this one. Since this room opens up to the main living/dining space, I wanted there to be a major wow-factor when you looked in. Since the shower is in the back wall, it meant the tile had to be the showstopper…and I wanted it EVERYWHERE. Floors and walls, and completely seamless from the entry to the vanity and toilet area to the shower, so that you focus on the tile and the bathroom as a whole as opposed to separate areas in the small space. The vanity will be really fun, too, but it’s staying in the same location as the before pictures show, which means it’s only partially visible from outside the bathroom. I haven’t seen a project with tile installed like we’re doing, so it has been a lot of fun coming up with the idea and now we’re seeing if we can actually make it work. On the moodboard you see the design for both bathrooms. This is Colorful Glam. When we do initial designs we have a lot of structure, but also a lot of flexibility for our client to sway the design one way or another to really make it their own. In this case, the structure that we gave was the idea of a colorful vanity and then the fun tile layout (more on that in a sec), half-wall of mirror, chrome fixtures and a cool vintage style chandelier. The flexibility came in how bold we would go with the color of both the vanity and tile, whether she wanted to keep the vanity top simple or splurge for some marble, and of course the final fixtures. I thought of having 2 types of tile, one that is a color, the other white. And then creating a shape with the color tile that is sort of like a rhombus squished on it’s side. I wanted it to go on the floor and up 3 walls. I proposed a curbless shower and just a simple partial glass partition between the toilet and shower so that the entire room would feel open and let your eye stay focused on this tile moment. Next week I will share a rendering of the space so you can visualize this crazy tile idea. I’ll also take some video in the the space so you can start to visualize how it’ll all come together. Thanks so much for reading along. Stay tuned each week for updates. And be sure to check out the other participants of the One Room Challenge!